IC 5148 (IC 5150, PK 002-52.1, PN G002.7-52.4), also known as the Spare Tire Nebula, is a beautiful, bright planetary nebula (PN) in the southern constellation of Grus, The Crane. It was discovered in 1894 by Walter Gale and his description of it led to it being assigned the number of IC 5150. It was then independently discovered by Lewis Swift in 1899 and it was entered into the IC a second time with the number IC 5148. The most common designation is IC 5148. It is 3,000 light years distant, several light years across and is expanding at an incredible 50 km/s making it one of the fastest expanding PN. The bright core is roughly spherical and about 2.3′ in diameter. In the colored image above, the field is 25′ x 25′ and north is up. There is interesting detail in the bright core with a mixture of OIII (blue-green) and H-a (red) emissions. The narrowband data were color mapped to provide "natural color". But, that’s not all. 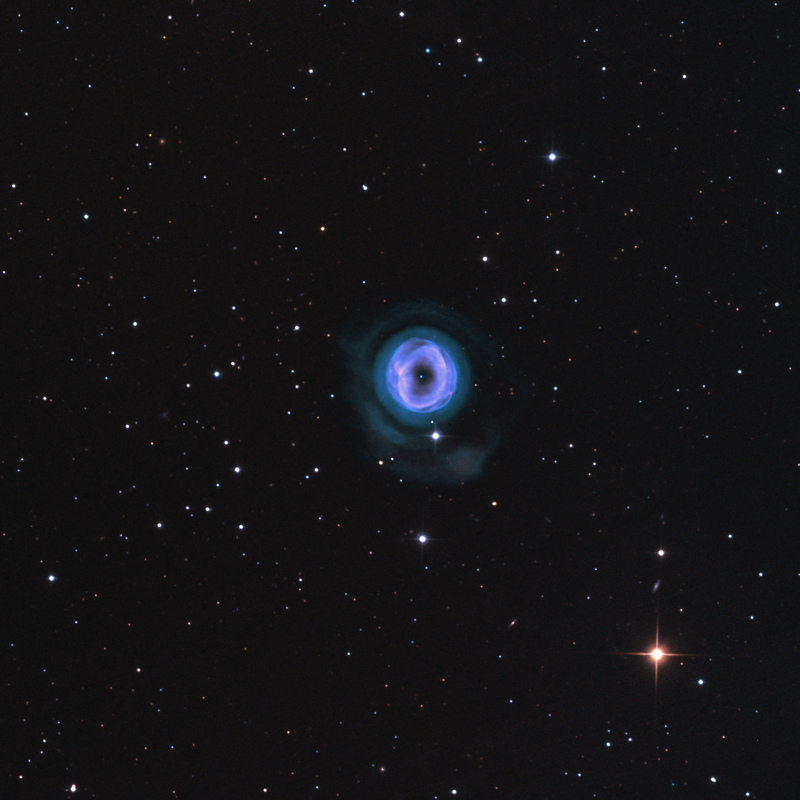 Recent deep amateur images suggested a very faint (blue-green) halo surrounding IC 5148 that requires a large aperture, considerable exposure time and the use of narrowband filters. This suggests the presence of oxygen in the halo in a high excitation gas at low density. Fortunately, our setup at Siding Springs, NSW, Australia combines all of that – a larger 0.5 m reflector telescope with fast f/6.7 optics and a very narrow (3 nm bandwidth) OIII filter. 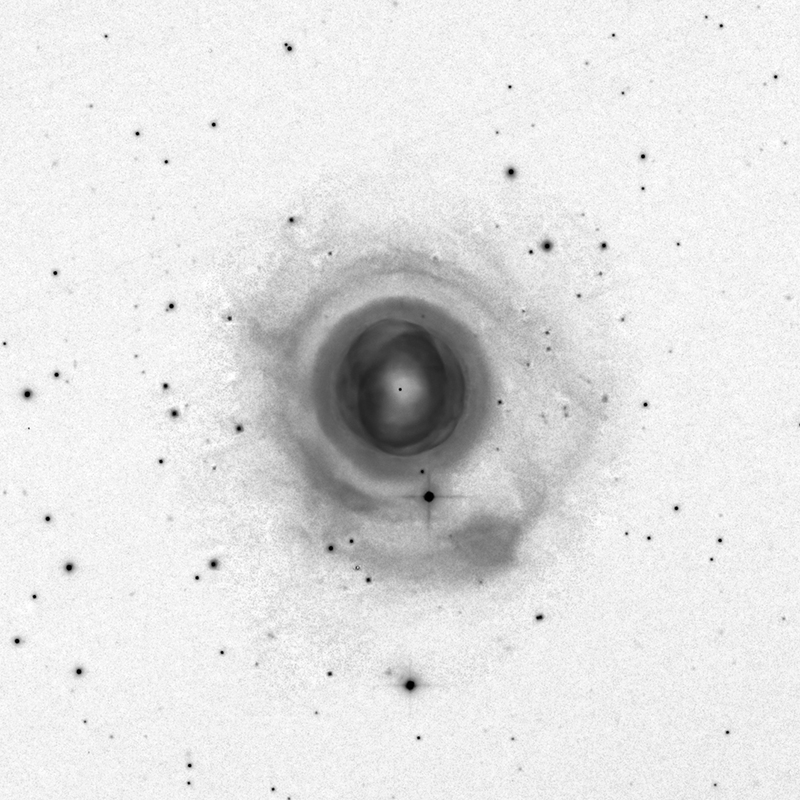 With 11 hours of OIII exposures, this elusive halo can now be seen to have an amazing structure (see OIII image below). This is the first detailed image of the halo showing such structure. It is about 6′ in diameter. There is an inner halo ring completely surrounding the bright core, then a gap and then what appears to be a spiral structure expanding clockwise. There appears to be an opening or dimming in the spiral toward the west (right). There is a much fainter H-a signal in the halo, the brightest of which is the larger "knot" in the southwest portion of the spiral. Liberties were taken in processing the color image to reduce the brightness of the core to show both the core and halo in a pleasing manner.